Why Implants? | How can implants help me? | What is the procedure like? W H Y I M P L A N T S ? Dental implants were pioneered in Sweden in the early 1960s. They are made of titanium and surgically inserted into the jaw bone to replace missing roots. 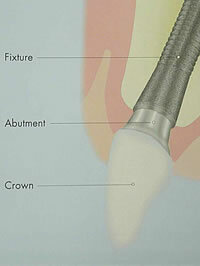 The implant, over a period of months, 'osseointegrates' acting as a solid foundation for reconstruction. Dental implants are appropriate for almost anyone who is missing teeth or at risk of losing teeth. Modern advances in dental science now allow tooth replacements which look, feel and function as natural teeth. Toothlessness is a major problem for many people. The difficulty of chewing combined with the fear of showing people that teeth are missing has forced many people into social isolation. 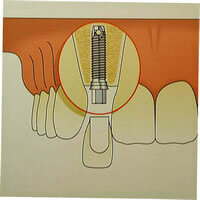 Implants are basically artificial roots which are anchored into the jaw bone onto which teeth can be firmly fixed. They are the foundations for greatly improved smiles and overall facial apprearance. Dental implants can provide patients with the comfort and assurance of permanently fixed teeth. They can help to restore the self-confidence and self-esteem often lost with false teeth.